CWR will be participating in a panel discussion on “Financing Climate Action” at 4pm. While Asia’s rapid economic development has impressed the world, the region still faces significant social and environmental problems, from lack of basic infrastructure, education and healthcare to poor access to finance for social entrepreneurs. This means Asia’s sustainable and impact investors can direct funds into solutions that can generate positive change. But while appetite for impact investing is growing in Asia – whether from millennials passionate about making a difference or philanthropists looking for alternative means of meeting their goals – the question is how to tap this demand. 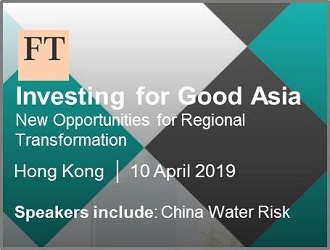 What will it take to advance this agenda and increase the proportion of global impact investing spending that comes from Asia? This major event – the latest edition of the FT Investing for Good series, now held in London, New York and Hong Kong – will explore the state of the impact investment market in Asia, the new opportunities opening up for investors, and the potential for innovative and sustainable finance to bring about transformative solutions to some of the region’s key challenges.